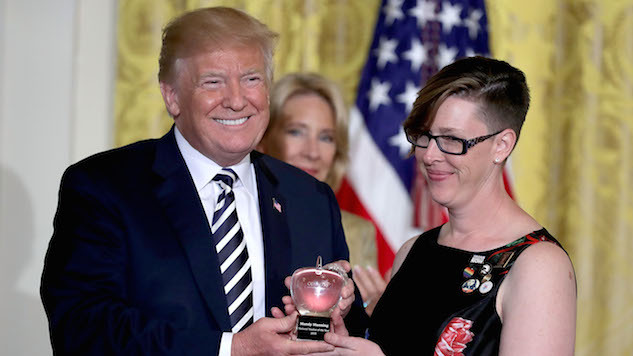 This year’s National Teacher of the Year award winner, Mandy Manning, wore buttons in support of anti-Trump causes during a meeting with President Trump at the White House. Among the causes she promoted were the Women’s March and transgender rights. Besides this show of silent protest, The Guardian reported that Manning declined to clap for Trump as he entered the White House ceremony. They also reported that Trump did not comment on or even seem to notice the buttons that Manning wore. Manning is a math and English teacher at Newcomer Center at Joel E. Ferris High School in Spokane, WA, and she works with refugee and immigrant students. Manning brought handwritten letters from her students to give to the president and, according to her, Trump told her he was excited to read the letters. She also invited him to meet with her students. Despite Trump’s statement in which he said he strongly supports the role of educators and schools, some in his administration, particularly Secretary of Education Betsy Devos, have received quite the backlash for their uninformed education policy proposals.